Heading south to Busan for the film festival today. Blog updates will be sparse. I will, of course, have my iPod with me, so I will not be completely out of touch. Thanks, Steve. Here's what I'll be seeing. ...a great new voice in the world of cinema, Rosario Garcia-Montero‘s “The Bad Intentions” is a brilliant coming-of-age story that’s funny, subtle, touching, and one of the best films of the year. The Idiot (Estonia), an adaptation of Dostoevsky's novel. The Reason Why I Step (Korea), a documentary about indie art and music. 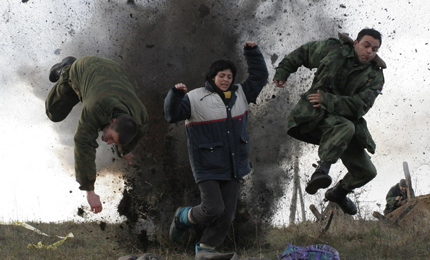 The Enemy (Serbia, Croatia, Hungary, Bosnia and Herzegovina), a film about clearing the minefields of the Balkan wars. “Stella Days” tells the story of a newly-arrived parish priest (Martin Sheen) who wants to open a cinema in the small town in the 1950s. His plans attract opposition from his bishop and some locals who fear the effect this outside influence might have on their way of life. Xelilo, a disturbed man, walks endlessly through the streets of the Kurdish village in the south east of Turkey. He is curiously being noticed by Cengo, a 12 year old boy, selling chewing gum. Their poor but carefree lives take a sudden turn, when the Turkish military takes power in 1980. The curfew and the resistance of the people become the centre of their lives with dramatic consequences.